Due to the extreme operating temperatures of a car’s brake system when being used on a race track, it is necessary to utilize brake fluid and pads that can withstand this higher level of heat. Standard replacement original equipment manufactured (OEM) brake pads and brake fluid are not usually capable of withstanding these conditions. When comparing brake fluids, the most important factor is the dry boiling point. The dry boiling point is the temperature at which a brake fluid will boil in its virgin, non-contaminated state. Brake fluid also has a wet boiling point, which represents the temperature it will boil after it has been fully saturated with moisture. Moisture will most often enter a racecar’s system when the brake fluid temperature goes beyond the dry boiling point. It can also enter the system due to high humidity. 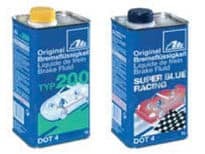 For comparison purposes, many standard OEM brake fluids (DOT 3) have an approximate dry boiling point of 401 degrees Fahrenheit (F) and wet boiling point of 284 degrees F. ATE’s Super Blue (DOT 4) racing fluid has a dry boiling point of 536 degrees F and a wet boiling point of 396 degrees F. There is also a DOT 5 rated brake fluid that is typically a silicone product, which can present an issue. While DOT 3 and DOT 4 brake fluids absorb moisture, DOT 5 fluid will not. Sounds like a good thing, right? The problem with DOT 5 fluid is that because the brake fluid does not absorb moisture, it results in moisture beads collecting in the brake calipers. These moisture beads can then lead to vapor lock, resulting in brake failure. Unless your car specifically calls for DOT 5 brake fluid, I recommend that you avoid it. When flushing the brake system, it is important to completely replace the old fluid with the new fluid. Some manufactures have two different color brake fluids available, such as ATE Super Blue and amber colored TYP 200. Each car’s brake system capacity will vary, but typically one liter (2 pints) will be plenty of fluid to flush the system. The price for ATE and TYP 200 brake fluid is typically $10 – $15 per liter can. The higher operating temperatures also affect a racecar’s brake pads. When the temperature exceeds the brake pads’ capabilities, brake fade occurs reducing braking efficiency. Manufacturers have developed brake pads designed for racing and various operating temperatures. When evaluating which brake pad compound is right for your needs, be aware that since race brake pads are designed to withstand high temperatures, it often results in a compromise in cold temperature stopping power. (This is why it is important to warm-up the brakes during a pace lap.) I recommend that when your order brake pads, you specify to the sales representative what conditions you will be using the brake pads in, such as competitive wheel-to-wheel road racing, and the weight of the car. Whether you purchase both front and rear racing pads depends on the vehicle you drive and your preferences. 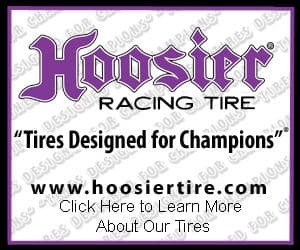 In the case of my front wheel drive Honda Prelude that weighs approximately 2,500 pounds, I often use race pads in the front and OEM style brake pads in the rear. A couple of reasons for this are that the front brakes perform the majority of the braking (thus the rear brakes don’t obtain as high temperatures as the front, where race pads would be needed). The brake pads you choose for the rear will also impact the brake bias of the rear brakes. Another advantage of using OEM style rear brake pads is the cost savings. Speak with other people who drive a racecar similar to yours to see what they recommend. My preference for performance and racing brake pads is Carbotech Performance Brakes’ products. Based on my experience, these pads are relatively easy on rotors, last longer than many other pads on the market, and offer great performance and feel. The company is also recognized as providing excellent customer service and the knowledge needed to match application needs. The typical cost a set for front racing brakes of Carbotech Performance Brakes’ pads ranges from $130 – $150. The subject of how often routine maintenance needs to be performed is often debated among racers. It is a bit surprising how diverse people’s timelines are to change the engine oil, brake fluid, and transmission oil is. I have heard many people state that it is necessary to change the engine oil, transmission oil and brake fluid after each race. My opinion is that doing this is really overkill and a waste of money. Think about how much it costs to change the engine oil – four or more quarts of oil in addition to a new oil filter. This adds up and creates a lot of waste. So why do people go to these extremes? The belief is that it is much cheaper to change these fluids quite often than replace damaged parts or, risk having the brakes fade during a race. I’m sorry, but there is a point when this simply becomes a waste of money and natural resources. How often do I recommend that you change the car’s fluids? I change the engine oil and brake fluid after every five race events and the transmission fluid once a season. By all means this does not mean that it is not necessary to keep an alert eye on the condition of these fluids. Check your oil before each and every session you go out onto the track. The oil level should always be to the top of the full line. If the oil begins to appear dark, change it. Don’t go beyond the full line because over-filling it can also damage the engine. If you feel any brake fade, bleed the brakes until you are positive that all of the air is out of the system, and make sure the brake reservoir is filled to the maximum line indicated. As precautionary measures, I do recommend that you bring extra brake fluid and the necessary tools to flush the system with you to the track in case it becomes necessary to bleed the brakes.